People are often surprised to learn that our federal government operates prison-based recycling plants. UNICOR, a company that is wholly-owned by the federal Department of Justice, operates several businesses within the federal prison system, including electronics recycling in seven federal prisons. Founded in 1934 as a work program to keep prisoners occupied, UNICOR has become a large government contractor, generating over $765 million in sales in 2005. The federal government uses UNICOR as its primary electronics recycler. View map of UNICOR prison recycling plants. Over the past few years, a storm of complaints about UNICOR’s recycling program from prisoners, prison guards, and others has brought these hidden sweatshops into public view. It led the Silicon Valley Toxics Coalition and the Center for Environmental Health, along with Prison Activist Resource Center and the Electronics TakeBack Coalition to publish a report in 2006 exposing horrific conditions inside the prison recycling plants. See below for report. In October 2010, the Inspector General concluded a multi-year investigation of UNICOR’s recycling operations and issued a scathing report having found numerous violations of health, safety, and environmental laws and regulations, as well as “gross misconduct” by staff working for the Federal Prison Industries. More. 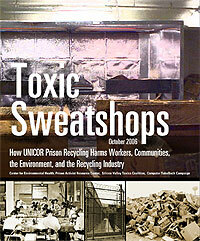 Toxic Sweatshops: How UNICOR Prison Recycling Harms Workers, Communities, the Environment and the Recycling Industry. Click to see complete “Toxic Sweatshops” report..
UNICOR has failed to adequately protect prisoners and staff from exposure to toxics. When dismantling electronics, prisoners handling toxic components need ventilation, proper tools, and adequate protective gear, as do prison staff working in the area. UNICOR facilities repeatedly failed to provide proper recycling procedures to captive laborers and staff supervisors. UNICOR’s policy of measured modernization- limiting automation in order to maximize the number of prisoners who work-increases the risk of workplace injuries to prisoners and guards. The adverse health effects of long-term exposure to the toxic materials in e-waste are costs that families and/or public health services will bear- not UNICOR. UNICOR has failed to protect communities from hazardous materials. UNICOR undercuts responsible recycling businesses. Not all electronics recyclers are the same. Much of what passes as “electronics recycling” is exporting harm – dumping e-waste on poor communities in China, India, Pakistan, Nigeria, and other countries. However, a growing segment of the U.S. electronics recycling industry is taking concrete steps to educate and to protect workers, communities, and the environment. These recyclers are being undermined by UNICOR’s government sweatshop model. UNICOR’s low wages, limited worker protections, and use of outdated equipment allow UNICOR to underbid conscientious commercial recycling operations. In December of 2011, Rep. Bill Huizenga introduced H.R. 3634, the Federal Prison Industries Competition in Contracting Act of 2011, which removes, to some extent, the requirements that federal agencies give UNICOR preferential treatment in contracting goods or services. “This bill requires the government agencies to at least open these contracts to the private sector as well for bidding, or requires them to shop around for the best value for the taxpayers’ dollar. The bill preserves market access for these products or services to the hard-working men and women of our districts. This is simply one more easy, common sense way to preserve jobs and help restore economic security for America,” Huizenga said in a February 2012 statement.